Summary Entry level two-bay Marvell-based NAS with same feature set as NSA325 / NSA325 V2. Buyers looking for a two-bay NAS have many choices. Recently, Tim looked at the ZyXEL NSA325 v2, an updated version of the original NSA325 that I reviewed in October 2012. Tim concluded that the NSA325 v2 was relatively expensive for a dual-bay single core SoC NAS, but it was loaded with features and provided decent performance. 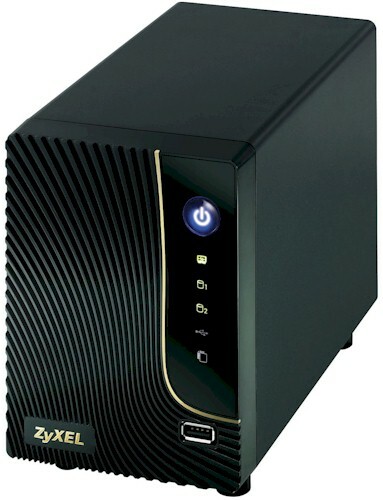 It turns out that ZyXEL has a solution for those who want the NSA325's features, but not its price.This review looks at the ZyXEL NSA320, a cost-reduced, lower performance version of the NSA325 v2. The feature set on the NSA320 is identical to what you'll find on the NSA325 v2, save for some bugs found in the 320's firmware that are not present in the 325 V2's more recent revision. The image below compares the NSA320 (left) and the NSA325 v2 (right). Both share the same LED indicators, power button and front USB port. It's important to note, however, that as one of the cost reductions, the NSA320 has three USB 2.0 ports. Both versions of the NSA325 have a single USB 3.0 port on the front panel and two USB 2.0 ports on the rear. The front panel of the NSA320 has a wavy plastic design more reminiscent of the original version of the NSA325. The image below shows the front and rear panel callouts for the NSA320. On the rear panel, the single Gigabit Ethernet port has two LED indicators to show link status status, speed and activity. The figure below shows a description for each of the status indicator's colors and states. The NSA320 is powered by a Marvell "Kirkwood" 88F6281 @ 1.2 GHz backed by 512 MB of RAM. Other key components are listed in Table 1, with those of the NSA325 and recently reviewed TRENDnet TN-200, which, like the NSA320, sells for $100. We'll be comparing performance of these three products later. The NSA320 drew 16 Watts with two WD RED WD30EFRX 3 TB drives we provided installed. The drives did not spin down, even with the network connection unplugged after the programmed idle drive spindown time elapsed. Fan and drive noise were rated as medium low and were audible in a quiet room. Since connectors, switches and LEDs are in similar locations on both the NSA320 and both versions of the NSA325, the PCBs closely resemble each other. The photo below shows the NSA320's board.